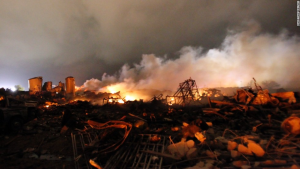 A final report on the West Fertilizer Company plant explosion in 2013, which left 15 people dead and more than 160 injured, has revealed that inadequate chemical storage was to blame for the blast. The West Fertilizer Company storage and distribution facility in West, Texas caught fire and subsequently exploded. The blast happened as firefighters attempted to drench the flames, leaving 11 firefighters dead. The blast shook the town of West, Texas. It was enormous registering on seismographs as a 2.1 magnitude earthquake and shaking homes up to 50 miles away. What was the cause and who is to blame for this horrific blast? The incident was labelled as “preventable” by the chairman of the U.S chemical safety board. Chairman Rafael Moure-Eraso described how the blast “should have never occurred.” The finger has been pointed at many different parties. The U.S. Chemical safety board blamed government regulators, other authorities and the plant owners themselves for the explosion. Poor chemical storage is broadly believed to be the primary factor involved in leading to this blast. It’s time for change in regards to how dangerous chemicals are being stored. According to TheHill.com the fertiliser plant was storing ammonium nitrate – the primary reason for the tragic blast. The report focuses on how the ammonium nitrate was being stored. It is believed that ‘ammonium nitrate which is used to make fertilizer, was stored in bins in a seed’. This improper storage proved to be disastrous. According to The New York Times the company: ‘stored 540,000 pounds of ammonium nitrate and 110,000 pounds of anhydrous ammonia at the plant’. However, the company did not appear to disclose the amount of ammonium nitrate it was storing. Dallas Morning News reported: ‘Fertilizer facilities like the one in West are not required to have liability insurance that would compensate for damage they might cause, state insurance officials say, even if hazardous material is on hand.’ It’s evident that the danger associated with these chemicals had not been recognised. In addition to these problems, it’s thought that McLennan County, Texas didn’t have an emergency response plan in place. It’s believed that one of the key issues cited in the report is the lack of fire codes. It must now be a top priority for industrial organisations in the US to review the manner in which dangerous chemicals are handled and stored. Eventually in April 2015, three bills were introduced regulating storage and inspection of ammonium nitrate and a fourth bill was also introduced to create a notification system alerting the public about any hazardous chemical leak at a nearby manufacturing facility – this bill was introduced throughout the whole state of Texas. Disasters like Texas and Tianjin in China clearly highlights the need for a global approach to improving health and safety legislation, in particular with the handling and storage of highly hazardous materials.